"Crew" redirects here. For the production crew, see Category:Crew. The logo of Planet Express. The Planet Express crew is the personnel of Planet Express. Although the term generally refers to only Fry, Leela, and Bender, this group encompasses and has encompassed plenty of other people. A list of members of the Planet Express crew. 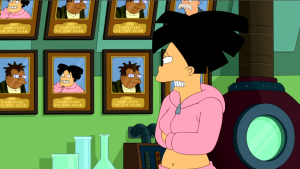 A list of members of the Planet Express crew who have been appointed employees of the year (6ACV10). There are also employees of the month (7ACV16). Amy looking at the employees of the past years (6ACV10). Since the Planet Express crew appears in every episode, comic, and film, this list only deals with media referred to above, where important information about it is revealed. This page was last edited on 19 November 2015, at 10:59.